Impact Study No. 1 is a light installation consisting of 24 white neon tubes of varying length. These tubes are installed along a wall, each oriented vertically and arranged according to a horizontal contour. Tubes vary in size from 3.5 ft to 8 ft and are spaced 1.5ft. The overall dimensions of the work as documented are 36 ft wide and 8 ft tall. The tubes are lit sequentially according to hybrid analog-digital control circuitry. 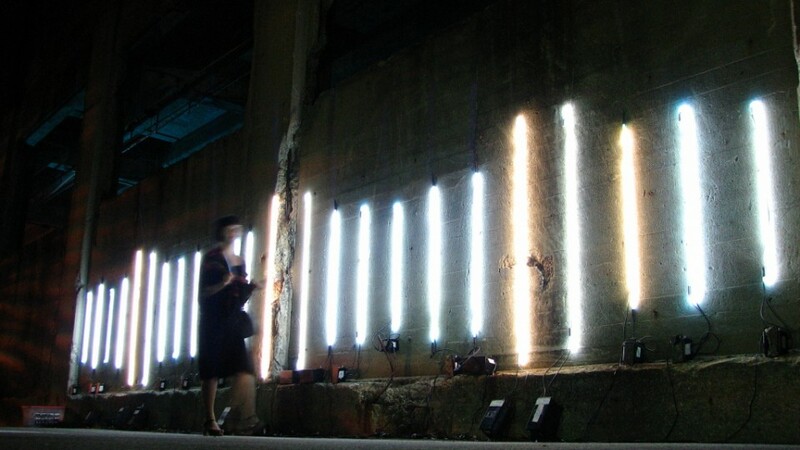 The circuitry detects radioactivity and translates it into a pattern of signals that are visualized as light moving along the formation of neon tubes. The effect will be that of rippling waves of light moving back and forth through the formation. The ambient lighting cast by the installation resembles light reflecting off the surface of a body of water.